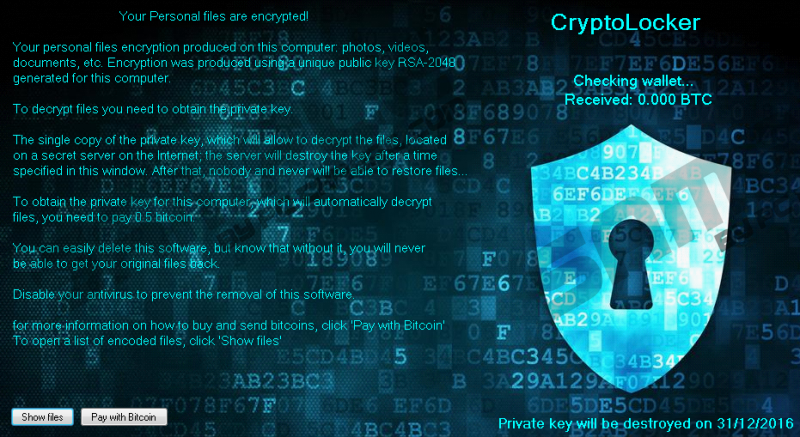 Cryptolocker3 Ransomware is a rather dangerous threat since it might damage the files most valuable to the user. If it enters the system, this malicious application might locate all pictures, photos, documents, or other private files and lock them with a secure cryptosystem called RSA-2048. Afterward, the ransom note from the malware’s creators may try to persuade the victim to pay them a ransom for a decryption key. At this point, we have to tell users that putting up with such demands is rather risky because there is a chance something might go wrong and you could lose your money in vain. If you are still considering this option, we would advise reading more about Cryptolocker3 Ransomware and only then deciding what to do. However, if you do not plan on risking your savings, we encourage you to take a look at the instruction placed below and erase the threat with no hesitation. According to our researchers, Cryptolocker3 Ransomware could be spread through Spam email campaigns or suspicious advertisements. Using these methods the malware’s creators should distribute a malicious file, for example, it might be an executable file, a text document, an image, and so on. In most cases, users download such data without realizing it is malicious and infect their system. Thus, to keep your computer protected from such threats in the future it would be advisable to scan suspicious email attachments or installers downloaded from unreliable sources with a trustworthy antimalware tool. As long as you do not launch infected data, it should not do anything to the system, so if you have even a slightest suspicious about a received file, make sure to check it before opening it. When you launch a file carrying Cryptolocker3 Ransomware, the threat should create its copy and place it in the %USERPROFILE%\AppData directory. It might create a Registry entry in the Run key too so that the malware would be able to appear each time you restart the system. After settling in, the malicious application should look for user’s personal data, for example, it could be files with the following extensions: .3gp, .abs, .aspx, .avi, .bac, .bak, .bmp, .db, .doc, .docm, .docx, .dotm, .dotx, .eml, .gif, .jpeg, .jpg , .jpge, .htm, .html, and so on. Then these files could be locked with the RSA-2048 cryptosystem. Users can recognize damaged data from the additional .cryptolocker extension that should be applied to each locked file. What’s more, after encrypting your data Cryptolocker3 Ransomware should display a ransom note on the screen. The message might explain to you how the malware damaged your files and how to pay a ransom to get a decryption tool. Apparently, the malicious program’s creators demand users to pay 0.5 BTC, which is more than 500 US dollars at the moment of writing. According to the note, if you pay the ransom the locked data will be restored automatically once the payment is confirmed and if you do not pay the ransom until given date the threat should delete the decryption key from a secret server. The problem is that the connection with this secret server could be lost as it happens with similar malware from time to time and in that case, your files would remain locked despite the fact the ransom was paid. Also, it is possible the malicious application’s creators could be lying to their victims. Therefore, without any guarantees, we advise users not to risk their money since the asked price is rather high. If you do not think paying the ransom is a good idea either, we advise you to remove Cryptolocker3 Ransomware immediately. It could be erased manually by following the instructions located just below this text. They will show users where to find the malware and how to remove it permanently. There is one more way to deal with this threat too. If you think the manual deletion is too difficult, you can download a reliable antimalware tool and let it get rid of the malicious application for you. Locate malicious files called Cryptolocker.exe and Cryptolocker2.exe. Select these files one by one and press Shift+Delete to remove them permanently. Find the malicious file you downloaded yourself and erase it the same way too. Find a value name called cryptolocker, right-click it and select Delete. Quick & tested solution for Cryptolocker3 Ransomware removal.